Communication skills are by far the most sought after skills in the workplace today. There is an absolute dearth of skills especially in the area of business writing. If you want to get a typical fresh graduate teary eyed and skipping heart beats throw them a writing challenge within their first week at work. It is an unfortunate reality due to the challenges that our educational system has and a growing disinterest from the younger generation of workers. Our line managers who should naturally take up the responsibility for improving writing skills through the writing challenges they give and the mentoring that should ensue often are unable to provide direction in this area because they too lack the skills or at least lack the techniques for teaching those skills. From writing memos, letters and reports to meeting minutes, letters, proposals and even newsletters and presentations, the skills for effective writing can be learned. 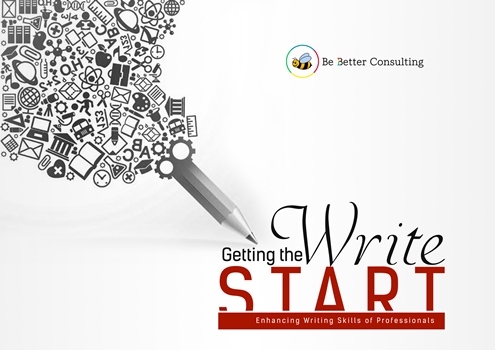 At Be Better Consulting, our Writing Skills workshop is designed to equip employees with techniques, tools and practices to enhance their writing skills. skills are very good and represent a major competitive advantage for the organization. editing and correcting documents for errors that should typically be avoided. is spent editing documents, ensuring a higher turn around for proposals, bids and presentations. risk because of the poor writing skills of a majority of its employees. writing skills of its employees who stand out in the industry as professionals.